We have decided to publish Drinking Fluxx! On July 24, 2017, Fluxx turns 21, and we are celebrating by publishing Drinking Fluxx! With rules that are always changing, Drinking Fluxx will keep you on your toes and shake up any adult party. You've never played a drinking game like this before! 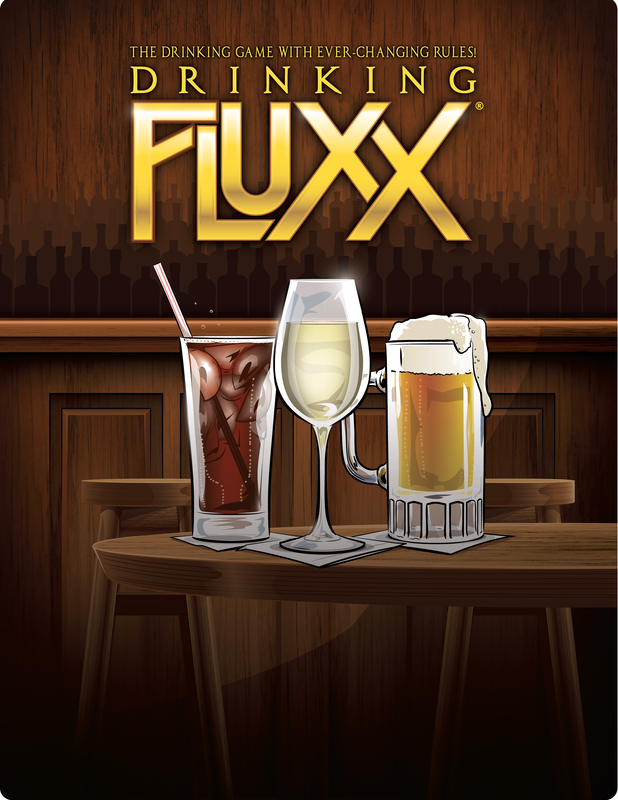 Drinking Fluxx will be published under our adult games imprint, Fully Baked Ideas, and will have a $25 MSRP, to help ensure that purchases are made by responsible adults. Drinking Fluxx will not be listed in the Looney Labs family games catalog. PACKAGING: We decided to go with our standard 2 part box with 6 game display, the same way Stoner Fluxx is packaged... after much discussion of other packaging options. One fun thing tho - we are printing the game on plastic playing cards! Our wildly popular Fluxx game engine is the quintessential beer and pretzels game, which led us to start developing an obvious new edition: Drinking Fluxx. Andy designed the game, Derek Ring illustrated it, and many of our friends and fans helped us playtest this awesome new edition of Fluxx. Drinking games have been around for generations and Fully Baked Ideas was excited to add something new to the mix. We started to prepare marketing materials and discuss our plans with our supply chain - and we started to receive concerns from trusted advisers about publishing this game. Many of our fans are college students, and the last thing we wanted to do is to encourage binge drinking on college campuses or anywhere else. So, we decided to put the cork back into the bottle and the bottle back onto the shelf and decided NOT to publish this game. But oh my goodness have our fans begged us to publish it! With Fluxx turning 21 next year, we decided the time was now to make this happen. It will be clearly labeled for adults. We will make every effort to encourage responsible drinking. But yes, it's true, we have decided to publish Drinking Fluxx next year. and all the other versions of Fluxx!